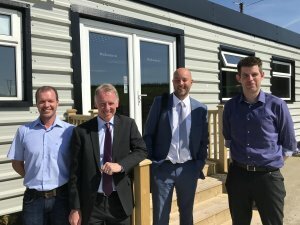 Fairhaven were delighted to welcome Alasdair Howie and Lee Page of Soler & Palau UK to our new offices this week. Alasdair and Lee made the short hop over from their UK base in Ipswich for our regular information exchange day, and thankfully they brought a bit of the East Anglia summer weather with them. Alasdair, Marketing Manager at S&P UK, briefed the Fairhaven sales managers on the latest product developments and marketing campaigns. New products include the Airsense range of integrated sensor controllers, a bolt on carbon filter unit for the CADB heat recovery units, and some imminent updates to the ubiquitous TD-MIXVENT range of inline mixed flow fans. On the information front, S&P have produced a library of application cards which help designers and contractors identify the best products for particular applications, and there have been ongoing improvements to the already excellent Easyvent fan selection website. Another major development is the acquisition by S&P of the Ferrari fan group in Italy, one of the largest manufacturers of industrial process fans in Europe. 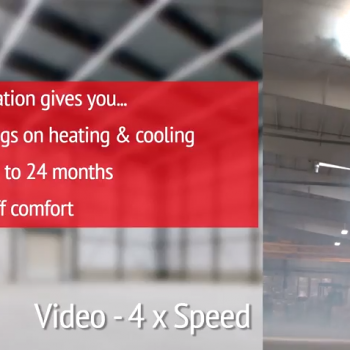 The Ferrari range is now selectable through Easyvent, and will enable us to offer a much wider range of fan solutions for industrial clients. Sales of S&P ventilation solutions continue to grow in Northern Ireland, and Fairhaven were pleased to report record sales turnover for the 2017/18 financial year. Lee, who is H&V National Sales Manager for S&P UK, confirmed that this trend is reflected in mainland GB, and that S&P continue to gain market share in the H&V sector, most notably through increased product specification and brand awareness. The RHE and CADB heat recovery ranges are doing especially well, alongside more established products such as the TD-SILENT and Contrafoil axial fan ranges. Working closely with S&P sales and technical staff, Fairhaven offer a wide range of quality ventilation equipment at short leadtimes and competitive prices, with helpful and friendly pre and post-sales service. Why not give us a call for your next project!